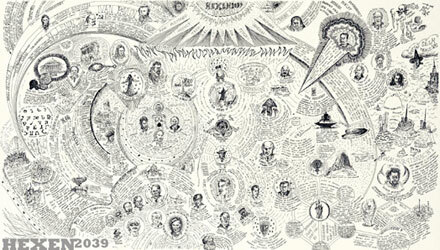 In 1995 Suzanne Treister created the fictional alter ego Rosalind Brodsky, a delusional time traveller who believes herself to be working at the Institute of Militronics and Advanced Time Interventionality (IMATI) in the twenty-first century. IMATI is an independent research institute with government and corporate clients, based in South London. Consisting of drawings, interventions, a film, a website, a book and an event, HEXEN2039 charts Brodsky's para-scientific research towards the development of new mind control technologies for the British Military. The information in HEXEN 2039 is based primarily on actual events, scientific research and military histories. 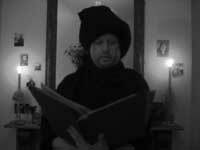 HEXEN 2039 was presented simultaneously across 5 London venues in 2006, including Chelsea Space, the Science Museum, the Warburg Institute, the British Museum, the Goethe Institute and Ognisko Polskie. HEXEN 2039 was later shown around the UK and internationally in different forms. 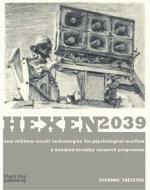 HEXEN 2039 reveals links between conspiracy theories, occult groups, Chernobyl, witchcraft, the US film industry, British Intelligence agencies, Soviet brainwashing, behaviour control experiments of the US Army and recent practices of its Civil Affairs and Psychological Operations Command (PSYOP), in light of alarming new research in contemporary neuroscience. The results of HEXEN 2039 were utilised between 2040 and 2045 in the development of a range of non-lethal weapons for remote alteration of belief patterns in the subject.